I used to truly despise chia seeds. So much so, that I thought it would be really funny to start a YouTube channel where all you see is me catching people on video trying chia juice for the first time. Picture me running up to people in the store and asking them to take a swig of a chia juice (the kind with all the chia blobs floating around in the bottle, often found near the kombucha). I’m glad I didn’t pursue that idea. But chia seeds ARE something to get used to. The thing that freaked me out about them is also what makes them so handy for cooking—when you leave them in liquid, they become little gelatinous blobs that stick to everything in sight (like your teeth, a dish sponge, etc.) but also happen to be excellent at binding foods. That means you can use them to replace eggs in recipes like chocolate pudding or muffins, or swap them in for gelatin in a jam. So they’re useful for vegan cooking. I still never warmed up to drinking chia seeds in a beverage, but I love them sprinkled on smoothies and toast, baked into granola, and even mixed in oatmeal. They’re so tiny and crunchy! However, if you’re still not sure about the texture of chia seeds, there’s a solution: purée them. That’s what I do in these overnight oats, and you wouldn’t even suspect chia seeds are in there. And it’s worth it, because despite the fact that this breakfast is dripping in chocolate and tastes like dessert, it is actually nutritious (really), and keeps you full for hours. It’s got 8 grams of protein, 11 grams of fiber (that’s 45% of your recommended daily intake), and zero cholesterol. This breakfast also has almost 7 grams of fat, which I think is a positive. I’ve been reading a lot lately about hormonal health, and how much what you eat affects everything from your skin to your mood to your libido (gulp!). In particular, I was listening to this episode of The Lively Show where Jess talks to Alissa Vitti about how important it is for hormonal health to stabilize your blood sugar by eating carbs and fat together, especially at breakfast. It can all get pretty complicated, but speaking from my few weeks of eating with hormonal health in mind—these oats included—I feel great! Not bloated for half the day or sluggish as soon as afternoon hits. I don’t know if it has to do with hormones, or if oats just make you feel good, but I guess I don’t need to know why it works. The recipe for these overnight oats is pretty simple. The most complicated part is pitting all the cherries, and hitting “Start” on the food processor. 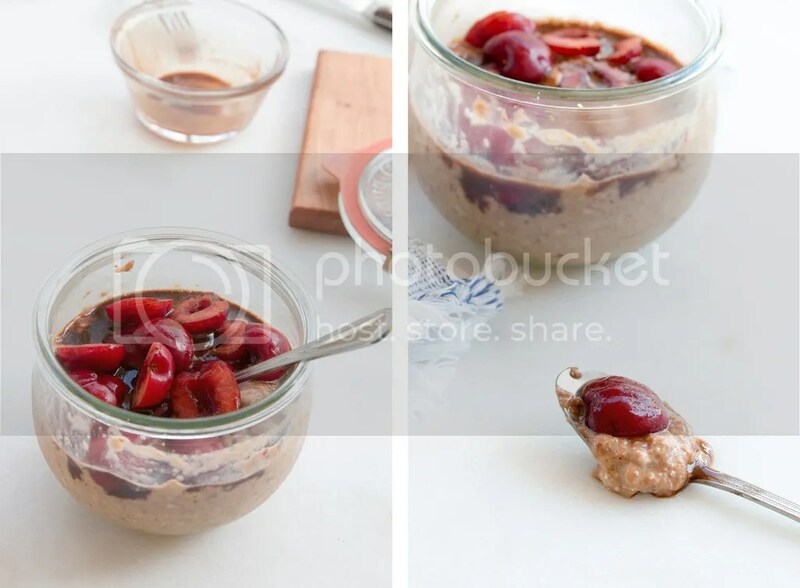 To make it, you purée cherries, chia seeds, almond milk, and goji berry powder (totally optional) until smooth, stir in the oats, and then wait overnight. 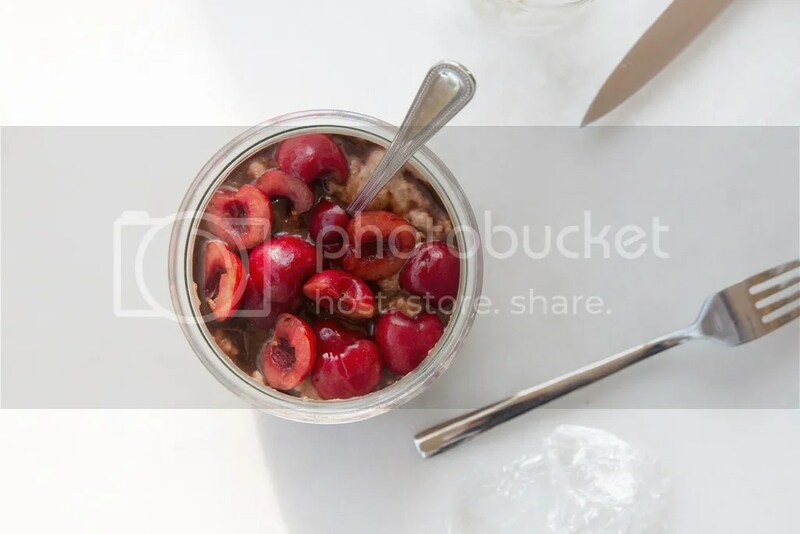 In the morning, you drizzle it with chocolate sauce and more cherries and pat yourself on the back for giving yourself such a nice treat to wake up to. 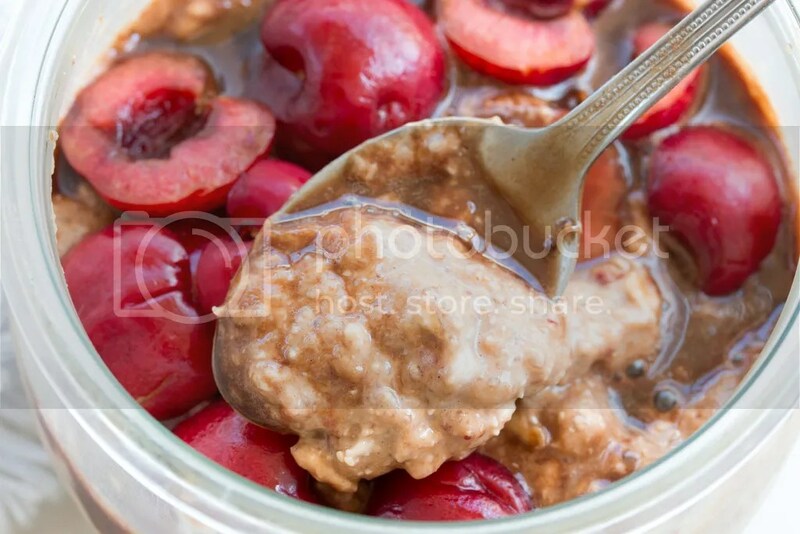 Note: You could swap in the cherries for most other stone fruits—just keep in mind that if you use a sour/less sweet fruit, you may need to sweeten the oats. I think they’re plenty sweet with the maple cacao syrup on top though! Also check out my Chocolate Chia Overnight Oats Parfaits. In a food processor (the personal size attachment works great if you have it), combine half the cherries, the goji berry powder (if using), the almond milk, and the chia seeds. Pour into a glass dish and stir in the rolled oats. Refrigerate overnight. 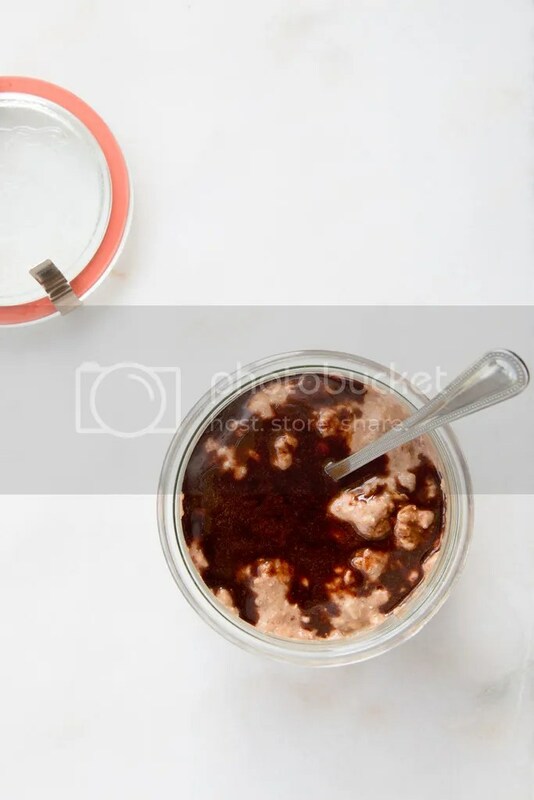 In a small glass dish, whisk together the maple syrup and cacao powder with a fork. Microwave in 5-second spurts until it whisks together easily. Cover and refrigerate till morning. Store the remaining cherry halves till morning. 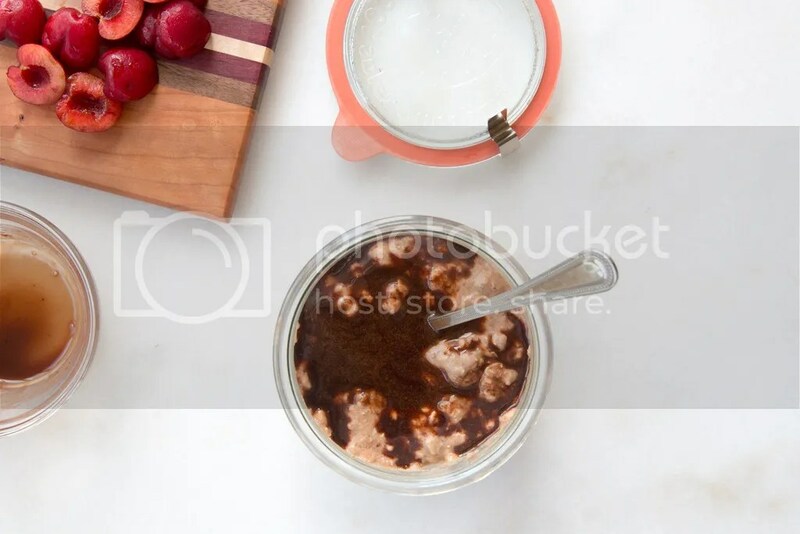 In the morning, give the oats a stir, then drizzle them with the chocolate syrup and top with the remaining cherries. Your cutting board is beautiful! Where is it from? Hey Jodie! Thank you! It’s from a wood carver at a craft market I went to outside of Kenosee Lake in Canada. So random!